CWShredder is a completely portable antivirus application which removes the horrendous CoolWebSearch malware which redirects you to unwanted web pages. 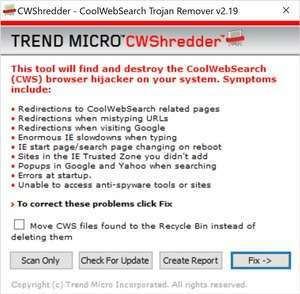 By removing CoolWebSearch with Trend Micro's freeware CWShredder, you effectively eliminate annoying popups and other rubbish installed along with CoolWebSearch. If you've been infected, this program is recommended to remove malware associated with CWS. For security reasons, you should also check out the CWShredder download at LO4D.com which includes virus and malware tests. Additional screenshots of this application download may be available, too.